Whatever your needs for building, remodeling or renovations in Lake Norman, NC, call our general contractors at Chad Goodin Signature Homes. There are many reasons why you might need the services of general contractors. At Chad Goodin Signature Homes, we are not just about building homes, although we do that extremely well. As full-service general contractors, we also do home renovations and commercial building and renovations. When you are talented in building homes and commercial buildings, it stands to reason that you can also update and renovate them. 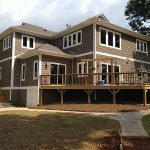 The home renovations that we do as general contractors in Lake Norman, NC include remodeling, home additions, guest house renovations, bathroom renovations, kitchen renovations, exterior renovations, and much more. If you need to modernize your home or add living space, we can give you results that will exceed your expectations. We can also put in a swimming pool and do other backyard design projects, so your outdoor space is as comfortable and useful as the indoor space is. The same holds true for commercial building and renovations. Over time, a commercial structure can need revisions, especially if the business use changes or your business outgrows its current building. If you need more warehouse space, an employee rest area or a larger showroom, let us know. We will be glad to provide ideas on how to accomplish your goals, and we will work in such a way as to create the least distraction to your daily activities. Whatever your needs for building, remodeling or renovations, call our general contractors at Chad Goodin Signature Homes. We don’t just build properties– we build dreams! At Chad Goodin Signature Homes, our general contractors proudly serve Mooresville, Cornelius, Davidson, Huntersville and the surrounding Lake Norman area of North Carolina.